This mod modifies all armor, both enchanted and unenchanted, including artifacts. Weights, prices, enchantment capactiy, health, and even the AR values have been changed. This mod incorporates Lurlock's Left Gloves mod and my own Left Gloves addon mod, as well as several bug fixes. Armor stats sometimes didn't make sense or follow consistent formulae for determining the various stats of armor. So, I went about and made a mod that balances the armor health, price, enchantment points, weight, and armor protection values. Medium armor is now just as good a skill to have as Heavy or Light Armor. Works with both new and existing games. This mod modifies all armor, both enchanted and unenchanted, including artifacts. Weights, prices, enchantment capactiy, health, and even the AR values have been changed. - All packages now use Lurlock's Left Gloves mod and my Left Gloves addon. However, they will not affect clothing item gloves. All necessary files have been included in this mod, so there is no need to download seperate mods.For details on the changes made to armor, please see the included html file. MAKE SURE TO REMOVE ALL ARMOR PIECES FROM YOUR INVENTORY BEFORE STARTING YOUR GAME WITH THIS MOD ACTIVE (or INACTIVE)! Please see the "Known Bugs" section of the readme for important info regarding encumbrance. ---- Feather Shield has chitin shield stats but has imperial shield mesh & icon, changed to a chitin shield to match stats. - The Imperial Newtscale Cuirass, Imperial Studded Leather Cuirass (rename "Imperial Leather Cuirass"), Imperial Silver Cuirass, and Imperial Dragonscale Cuirass are now recognized as Imperial Legion uniforms. - By default, the main AIM download has set up the Jury-rig Wraithguard to use a fully animated and physicked left-hand mesh that looks just like Wraithguard, and will benefit from any texture replacers you may have. If you want a different option, please download the Wraithguard Pack, which provides AIM esps for the various options you can also find in my Jury-rig Wraithguard Replacer mod. !! !This mod can be used with existing games. In other words, you do NOT have to start a new game for this mod to work! However, you may notice that if, say armor health was 600/600, but my new AIM stats set it to 800, the armor health will now be 600/800. This is not a problem if the armor health has been decreased.!!! - This mod has been cleaned with TESTool. - Thanks to Autocthon for his help and advice for improvements to this mod. - Lower-end Heavy armors have higher AR (Armor Ratings) than before; they are also slightly more expensive. - Bonemold armors now have consistant AR values. Regular Bonemold AR is 16, Armun-An and Chuzei AR is 17, and Gah-Julan AR is 18. - Adamantium Armor is now one of the best base unenchanted Medium Armor with an AR of 60. Indoril and Royal Guard armor have an AR of 65. - The heaviest piece of armor is the Daedric Cuirass, which now weighs 54 MWU (Morrowind Units). - The magnitude of the Resist Frost enchantments for the Bloodmoon Snow Wolf and Snow Bear armors are different for each armor piece; the magnitude is now based on how many pelts were used to create the particular armor part (e.g. helmet, cuirass, greaves). - In the game engine, 40% of hits will land on the cuirass, and 10% everywhere else. The new HP values for boots, greaves, helmets, gauntlets, and pauldrons are roughly the same, though there are differences based on the size of the area the armor protects. For instance, I calculated that gauntlets and helmets cover about the same surface area. Boots have slightly more material than greaves. Shield and Tower Shield health has been greatly increased. Although only 10% of the hits will land on the shield, with a successful block the shield will take most of the damage. - enchantment capacity is now based on the quality and mass (as in, how much material the armor is comprised of) of the armor part. Helmet enchantment capacity is reduced, while the capacity for other parts is increased from vanilla; now, pauldrons are viable enchantable armor pieces! - Light armor recieves a 25% bonus to its enchantment capacity, and Medium armor receives a 15% bonus. Certain specific armors of all armor types have small EP (enchantment points) bonuses. A few have penalties (Dwemer and Goblin armor). - the Ten Pace Boots are now light armor; the lore description said the boots were made out of heavy leather (in Morrowind, the Heavy Leather boots are classified as Light Armor). - Auriel's Shield now has an enchantment, as similar as I could make it to the recorded lore about the enchantment: Constant Effect Fire Shield 30pts, Resist Magicka 20pts, Shield 5pts on Self. - Some names have been changed. Ice Armor is now Stalhrim Armor. "Left Glass Bracer" is now "Glass Left Bracer" to match the rest of the armor naming scheme ("[Material] [Left/Right] [Pauldon/Gauntlet]"). regular Mournhold "Her Hand's" armor has been renamed to "Indoril Guard [armor part name]." The enchanted armor belonging to the Her Hand's NPCs is still named "Her Hand's [armor part name]." - Bracers now weigh slightly less (and have slightly less health and enchantment capacity) than gauntlets; this is because bracers don't cover as much of your body (and hence contain less material) than gauntlets. - an html file that lays out the changes to the base armors and the artifacts. + AIM_MW_1dot0: Download this if you have Morrowind, but do NOTt have Bloodmoon and Tribunal. Will not change Adamantium armor, even if you have the Adamantium Armor plugin. + AIM_MW_TB_1dot0: use this if you have Morrowind AND Tribunal, but NOT Bloodmoon. + AIM_MW_BM_1dot0: for users with Morrowind AND Bloodmoon, but NOT Tribunal. Will not change Adamantium armor, even if you have the Adamantium Armor plugin. + AIM_MW_TB_BM_1dot0: for people with Morrowind AND Tribunal AND Bloodmoon. + JWR_Pack_AIM_1dot0: contains JWR .esps for the DarkR and DwemerR Jury-rig Wraithguard downloads with AIM stats. Cleaned with TESTool. Download this if you want to make Jury-rig Wraithguard a Right-handed Gauntlet that looks either like Wraithguard, or uses a new texture. Does not includes all the necessary files, so you will have to download my JWR mods for the files. + AIM_Tutorial_1dot0: a brief tutorial, with pictures, that goes over how to add mesh replacers to the AIM mod. + AIM_Resources_1dot0: contains .txts file and .xls files of all the changes to every piece of armor (name, weight, price, health, enchantment, AR), the calculations used to change the game settings, and the .xls file used for all my calculations. If you don't have Excel, you can download Open Office ( http://www.openoffice.org/ ) and use the "calc" utility as you would Excel. Contains .html versions of the .xls files, so you can look at them without needing a special program (I think). This mod will conflict with other mods that modify the same objects (armor pieces), even if they are modified in a different way. This mod will conflict with any mods that alter the aforementioned Game Settings. This mod will conflict with any mods that alter the meshes found in this mod. If you have other mods that add armor, you may need to adjust their weight. In Morrowind, Light armor is any armor that is up to 60% of the i[armor part]weight. Medium armor is any armor then between 61% and 90% of the i[armor part]weight. Heavy armor is any armor over 91% of the i[armor part]weight. You may find that armors previously classified as Medium are now classified as Heavy. Please see the tutorial for information on how to change armor weight. You can also use the formulae from my spreadsheets to calculate new weights. If you are using an armor replacer for any of the armors, please see my AIM Tutorial. It will show you how you can keep the new meshes/textures for armor replacers but also have the effects from my mod as well. MAKE SURE TO REMOVE ALL ARMOR PIECES FROM YOUR INVENTORY BEFORE STARTING YOUR GAME WITH THIS MOD ACTIVE (or INACTIVE)! 1.0, 2009/1/20 - Revises several armor properties for even better balancing. Removed old resources and the old tutorials. Includes UUMP mesh fixes. Changes Lefthand Wraithguard. 0.6, 2008/8/12 - Allowing ratings and comments at PES. 0.6, 2008/8/09 - Added note regarding encumbrance value. Nothing in the mod has been changed. 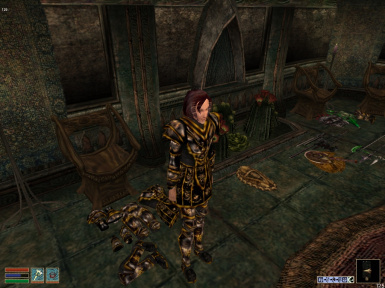 0.6, 2008/8/08 - Fixed Left Gloves compatibility plugin bug (Newtscale, Dragonscale, Leather, and Silver cuirasses didn't have Legion Uniform Script). Please re-download the appropriate archive for the new plugin file if you are using the Left Gloves and Left Gloves Addon compatibility esps. 0.5, 2008/8/07 - Initial release. Thanks to Autocthon for his input, help, and suggestions with this mod. Thanks to Alphax for the Wraithguard meshes and Ten Pace Boots fix. 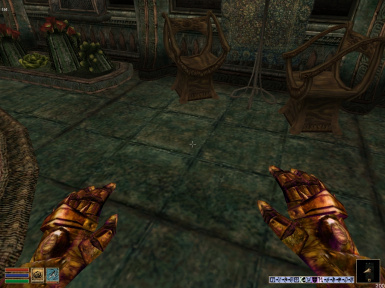 Thanks to Thepal, quorn, and the Morrowind Modding Community for the UUMP. Thanks to the folks on the Bethesda Forums for their support and feedback. Thanks to Harlequin and Tyrthyllanos for their support and feedback during the creation of this mod. Thanks to ElricM for hosting mods. Thanks to Microsoft Excel, without which I probably never would have attempted this mod. Thanks to ghostwheel for creating TESTool, with which this mod was cleaned. You can do whatever you want with this mod but all I ask in return is that you give me credit if you distribute any part of this mod. I would also like to know what mods are including my work. If you use Alphax's Wraithguard meshes, make sure to give him credit for them.